Today, KVFD sold Rescue 8, the 1993 E-One Cyclone Rescue Pumper, to the Country of Chile. 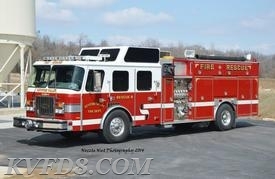 Rescue 8 was purchased brand new in 1993 by the Parkesburg Fire Company under the command of Chief Klingler. It was a front-line apparatus that served the citizens of Parkesburg and surrounding areas for many years as the primary Rescue and as a first out pumper/rescue piece. Rescue 8 was sold to Chile and left Monday, January 22, 2018, for the long ride to its new home. KVFD has placed an order for a "New" Rescue 8 from Pierce which is the first piece of apparatus purchased under KVFD since the consolidation in 2013. The New Rescue 8 will be a Pierce PUC Rescue/Engine which will be housed in the new Central station.The new truck is currently being built by Pierce and is expected to be delivered in April 2018. It will be the first piece of apparatus displaying the new KVFD new paint scheme similar to Chief 8's. Chief Engineer Gary Myers and FF George Budzik say good-bye to Rescue 8.